On Saturday, Jan. 12, Tech released its early action decisions, with 4,000 applicants admitted. Over 20,000 students applied for early action and 20 percent were accepted. The number of applicants grew 12 percent compared to last year. Tech is becoming even more competitive, with the percentage of students admitted decreasing by 6 percent since last year. In total, 37,000 students have applied for admission in both the early action and regular decision rounds, up from 35,600 last year. Since the 2013 switch to the Common App, Tech has seen a consistent increase in applications each year. 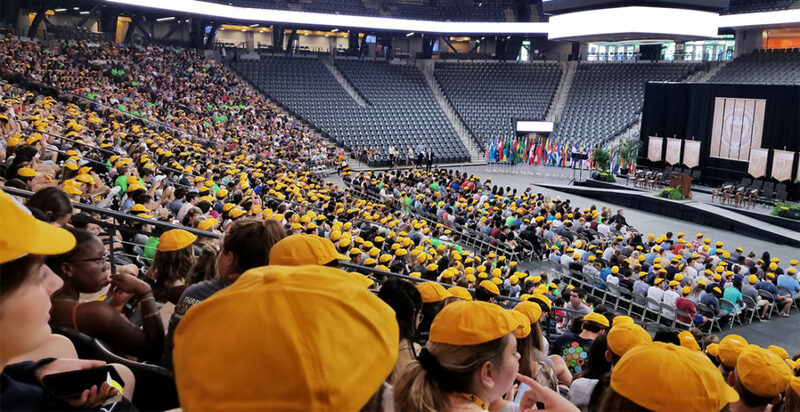 Of the students who applied early action, 20 percent were accepted, 20 percent were deferred and 55 percent were denied, according to Rick Clark, the director of Undergraduate Admission. 40 percent of students from Georgia were accepted, while out-of-state students were accepted at a rate of 14 percent. The admitted profile lists the mid-50 percent SAT score range as 1450-1550 and the mid-50 percent ACT score range as 32-35. In total, students from 318 Georgia high schools were admitted from 96 different counties. Students from all 50 states, including D.C., Puerto Rico, Guam and the U.S. Virgin Islands were admitted. Additionally, students from 55 different countries were admitted. Early action applicants are eligible for scholarships such as the merit-based Stamps President’s Scholarship. Only 40 students are selected for this scholarship. Several students received news of their acceptance in person. The Tech Admissions team traveled to schools in Atlanta, Warner Robins and Winder to directly deliver acceptance letters. Besides early action and regular admission seasons, there are other pathways for students to enter Tech. Each year, the Institute enrolls about 1,000 transfer students through “Transfer Pathway Programs.” There are six pathways that students can take, including the “Georgia First Pathway Program,” which offers first-generation college applicants entrance to Tech in the fall semester.